All the major Internet giants, including Facebook, Google, and Amazon, have been able to build their empires based on their users’ data and are now among the most influential companies in the world. But what do we—as data suppliers—get from these corporations for training and refining their algorithms? To be fair, we are usually allowed to use their services free of charge, but is this really a fair compensation? Internet users are not only feeding companies with more and more private data, they are, at the same time, giving up their data ownership. And what happens to them afterwards, is not entirely up to us. Data leaks, such as last year with Facebook, show that our data is usually not secure with these companies. Besides, enterprises such as Facebook and Amazon, in particular, are very attractive targets for hackers due to the quantity of available data. Internet pioneer, Jaron Lanier, recently also urged that the Internet should be modernized. Moving away from a free-of-charge culture towards one in which users are also paid for their data. The startup MADANA is now developing a system that may revolutionise the way the Internet handles data. The software should allow you to sell your data without losing your proprietary rights. For instance, if MADANA’s software is installed on your smartphone, location data and other metadata can be collected. This data is then encrypted and analysed. However, the buyer of the data does not receive a full dataset, but a complete data analysis. The data is first encrypted, then analyzed and MADANA will only provide buyers the insights instead of the whole data set. 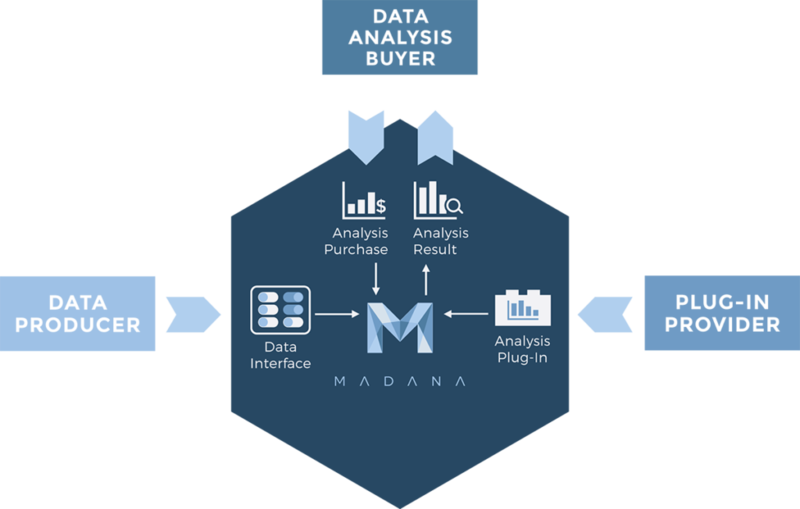 MADANA uses the so-called Trusted Execution Environments (TEE) for the data analysis. These are protected hardware modules whose processing cannot be seen from the outside. In this way, the raw data remains protected and only the results of the analysis in an encrypted form are available to the buyer. This procedure also allows sensitive and personal data to be evaluated without the buyer being able to draw conclusions about the individuals. The founders of Madana, Christian Junger and Dieter Schule, met each other during their studies at RWTH Aachen University. In 2014, the duo co-founded the Bitcoin Aachen Group. This made them one of the first in Germany to officially address the topic of blockchain and organise meetups on this topic. MADANA is now one of the first blockchain companies to operate entirely under German law. At the end of last year, the start-up completed an ICO audited by the Federal Financial Supervisory Authority (BaFin). The project on LISK’s sidechain received a lot of attention, because the ICO represented a major test for LISK as a competitor to the already established Ethereum.